This piece was inspired by an early New England figurehead. She is sculpted using old world techniques and painted in a salmon colored gown. 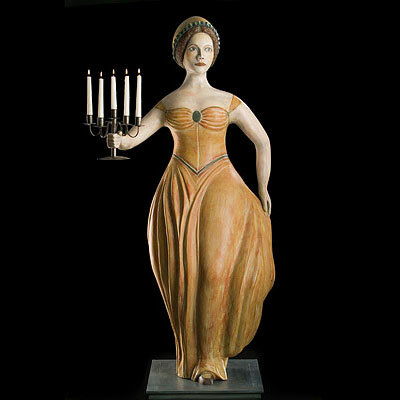 She holds a tin candelabra handcrafted by David Claggett of Weston, Vermont. The artist has kept this piece in his dining room and lights the candles on special occasions. She is mounted on a pedestal with antique iron wheels to replicate the charm of an old shop figure.